A wedding dress is considered to be the single most important piece of clothing there is by many women. It’s no wonder there is such concern regarding preserving these gowns, whether it’s to keep as memorabilia or to pass down. For those who have big days coming up, these are simple ways to ensure a gorgeous dress stands the test of time. Unfortunately, many brides don’t realize the importance of wedding dress preservation until months or years after their wedding. Wedding dress preservation should be the first step one attends to after returning from a honeymoon. After six weeks, stains have already set into a wedding dress, making it particularly difficult to address them with professional cleaning services. It’s best to do research well before the wedding to find a professional cleaner or preservationist, and then assign a bridesmaid with the task of taking the dress to them the day after the wedding. We’ve also had mom and dad take care of the wedding gown preservation. Fortunately, your research should not have to take you far! Darianna Bridal & Tuxedo provides a fully organic dry cleaning, pressing, and preserving service for your wedding dress. We use a company that has been preserving wedding gowns for over a hundred years. They are so good and trustworthy at providing this service that we use them to clean our sample gowns in our store. They are returned to us looking like new. The dress is organically cleaned, pressed, and preserved. It is placed in a beautiful display box and comes with a handy carrying case. The service also includes 3 basic accessories (veil, jacket, garter, gloves, etc.) for preservation. Wedding dress preservation is also a thoughtful gift idea. If you know a bride recently married or soon to be married, call or come in for a gift card for her to use for this wonderful service. This is a great gift for bridal parties to present to their bride as well. Wedding dresses come in different styles, colors, and fabrics, all of which may need special attention. 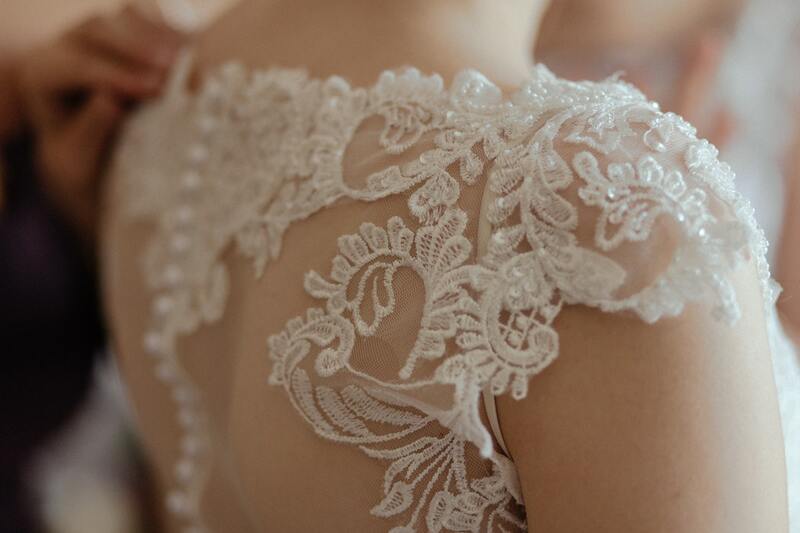 Lace will require a different cleaning method than silk, and the same goes for cleaning a wine stain versus a sweat stain. Beading is especially tricky to properly clean. Check the tag or label on the dress to determine if it has special care instructions related to dry cleaning or the type of chemicals that may be used on the dress. If in doubt, contact the dress vendor for more details about proper cleaning and preservation. Be cautious of going to a standard dry cleaner, even if they say they can clean wedding dresses. As a rule of thumb, if the dry cleaner doesn’t clean at least 100 wedding dresses in a year, then it’s better to opt for a professional cleaner or preservationist who has the experience in cleaning gowns. Check pricing, too. We have, and our pricing is hard to beat. Plus, Darianna Bridal & Tuxedo brides get a special discount! Even if a wedding dress looked pristine when it went into storage 30 years ago, keeping a dress in the wrong conditions can be ruinous. Be sure to store the dress out of direct sunlight, which can fade the dress or even turn it yellow as time passes. Remove it from the hanger and store it in an airtight preservation box or wedding chest—many preservationists will provide this as part of their cleaning. Avoid using plastic zip-up bags to store the dress, as they can misshape the gown over time or possibly trap moisture. A wedding dress is an investment that will hold a lifetime of memories. For more information about wedding dress preservation or to begin searching for your perfect dress today, call Darianna Bridal & Tuxedo at 215-491-8500 to schedule an appointment today. We’ll work one-on-one with you to help you find the perfect dress for your big day.